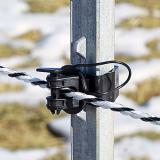 For insulating and attaching a conductor to an in-line steel T post. Designed to fit between the post studs. Combines wrap around design with a pin lock style face. 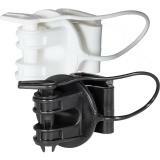 Extra strong—more plastic (virgin polyethylene) in these than similar farmstore insulators. 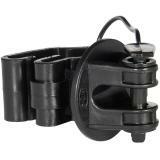 Designed by Premier to be the best T post insulator available. Hook the short side of the insulator onto T post. 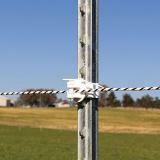 Pull or push the long side of insulator around the front of post. Hook long side around the back of post. Remove pin, insert conductor and replace pin. Steel T Posts, 7 ft. Recommended: 6 out of 7 said they would recommend this product to a friend. Stretching the insulator before installing it makes the process much easier. If you try to remove the pin from the lock (after it has been inserted) you might tear the plastic cord that holds the pin to the insulator (a minor headache). 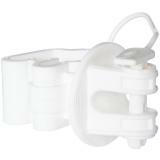 With that said, we really do like this insulator, it goes on easier than other insulators. Love my new fence insulators! They are built with quality in mind. It holds the Premier rope fencing on well. They are easy to see when checking the fence line. Great product and will most certainly buy again as needed. Thank you Premier! work great. able to do large areas in a short amount of time. 6 months of use. Great so far. Work great for inline with electrified rope. 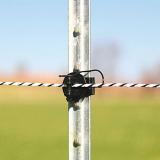 Work great for temporary corners with electrified twine. These go on easily and hold twine securely. The best T-post insulators I've even found. I have been very happy with these insulators to date. They have given me 3 years of good service and are easy to install.